for this BRLPS Vacancy of Community Coordinator and OFFICE ASSISTANT posts is 15-04-2019. Candidates selection for this BRLPS Community Coordinator and other posts is on basis of merit in qualification, written exam or interview. Short listed candidates only called for BRLPS Recruitment 2019. Apply online for this BRLPS recruitment through official website of https://jobs.brlps.in/. 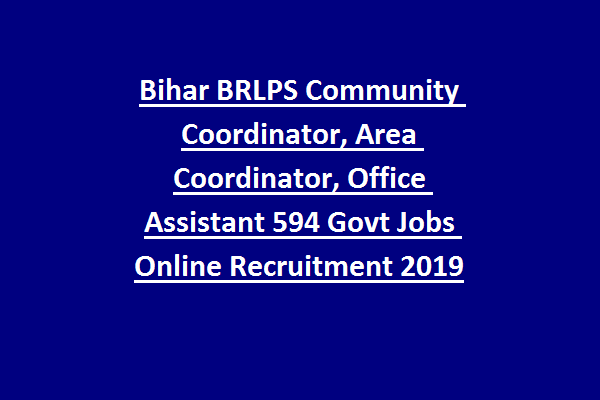 Community Coordinator Exam Result, qualification, BRLPS age limits, post wise salary and other details of BRLPS Community Coordinator, OFFICE ASSISTANT jobs recruitment online 2019 notification is given below. 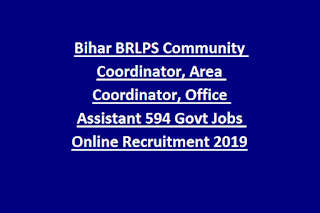 There are 594 vacancies in this BRLPS Community Coordinator, Law Assistant, and OFFICE ASSISTANT jobs recruitment 2019. Post Name and no of posts are updated below. As on 10-02-2019 upper age limit is 37 years for General Male candidates. For UR/BC/EBC Female and for Male BC/EBC candidates age limits are 40 years. Candidates will be shortlisted based on received applications. Short list will be prepared based on merit and work experience. Those who are short listed they are only called for written test or interview for this BRLPS Community Coordinator jobs. Candidates can apply online for this Bihar Rural Livelihoods Promotions Society vacancies on or before 15-04-2019. BRLPS short list date, written test date, and community coordinator exam result date and other information will be updated in http://jobs.brlps.in BRLPS website.